See in Glossary, which is then rendered at the Tile’s location on the Tilemap Grid. 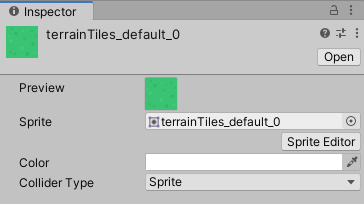 Preview Displays a visual preview of the Tile with the selected Sprite. Sprite Select the Sprite texture to be rendered on this Tile. Click the circle icon to the right to open the object picker window to select from the available Sprite Assets, or drag a Sprite directly onto this box. 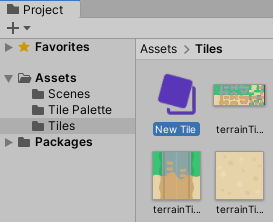 Color Tints the Tiles placed on this Tilemap with the selected Color. When set to white, the Tiles are rendered with no tint. See in Glossary generated for the Tile. None No Collider is generated. Sprite The Collider shape is generated based on the selected Sprite’s outline. Grid The Collider shape is based on a cell of the Tilemap. The shape of a cell depends on the Cell Layout selected for the Tilemap.